If your little ones love to dance then�Shooting Stars Dance School�based in Carshalton is a great local place for them to start. Opened in 2011 by Annabel Fraser,�Shooting Stars�offers children a chance to have fun, interact with others of the same age and, most importantly, learn how to dance! "We teach ballet and disco and will be introducing tap very soon," says the school principal Annabel. "We always like to keep the children working towards goals, whether it be a charity fund-raiser, a fair or fete, or their disco and ballet assessments." Annabel currently teaches a popular after-school class at St Mary's Infants' School in Carshalton and runs classes for older children at the 1st Scout Hut on Ruskin Road from 3.45pm - 4.45pm for ages 6-8 years and from 4.45-5.45pm for ages 8-11 years. "I offer half an hour of ballet followed by half an hour of disco," explains Annabel. "I'm really looking forward to starting a beginners tap class very soon." With plans to also start a baby ballet, tap and disco class too, Annabel really has got every style and every age-group covered at this popular Carshalton dance school. 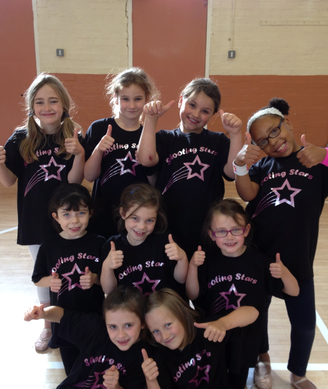 If you have a child that loves dancing why not bring them along to�Shooting Stars�Dance School for a FREE trial lesson?